Frankly saying, One of the Major Reasons why people start blogging is 'money.' And I realized it when some people started asking me How can they earn money like me? and How to start a blog and earn money?. To be honest, I never blogged for money and I was not even knowing about Adsense when I started blogging back in 2009. I first monetized my blog with Adsense in November 2011 and that was around 2.5 Years after I first started this blog. In Today's article I'll be sharing Some Best Ways to Earn Money from a blog. So if you are frustrated because Google Adsense is not approving your site then not anymore because you can try some other ways to earn money from your blog. A Few days back I Interviewed a Top Pakistani Blogger "Ammar Ali" from AllBloggingTips. I asked him to share his Money Making sources and was surprised to learn that Ammar does not use Adsense for Monetizing his blog. On Asking Why and How he Monetizes his Blog? Here is the exact answer from the Interview. Ammar Ali - "My major source of income is affiliate marketing. I’ve created a deals page for this. My other main source of income after affiliate marketing are direct ad sales, paid posts." So This is a perfect example stating that You can Still Earn tons of money from blogging even if you don't use Adsense. So Stop those silly excuses "Adsense is not approving My Site" or "Earning Money without Adsense is not possible"
Before beginning I would like to share Money making Tip: If you want to earn money through blogging then Never monetize your blog for at least an Year after starting a blog. For an year work on building followers, subscribers, quality content etc. After an Year you'll be having a good amount of articles and decent visitors. Now is the Right time to Monetize your blog and start earning. Since your blog is an year old and is receiving traffic, Monetizing it will help your earn decent amount then those few cents which would have got if you monetized blog soon after starting it. When it comes to earn money from a blog, The First thing to come in mind is Adsense or Other Advertising Networks. An Advertising Network is a company who take Ads from their clients and then forward them to Publishers Website/blog. This means a Blogger signs up for a Publisher Account and then Places Ads on his/her blog and when a visitor clicks on those ads, The Advertising Network pays him the amount set by the Advertiser. This is the Most Popular way of earning money from a blog and the best way is to start with Advertising Networks like Adsense, Chitika etc. I recommend Adsense but many people get rejected by Adsense and For those they can try any of these 60+ Advertising Networks to Monetize their blogs. Also See: 5 Best Google Adsense Alternatives for New Blogs. Direct Ads are when you sell Ad spots on your blog to people and get paid in return.You can straight away sell Header Ad spots (728x90 and 468x60), Sidebar Ad Spots (300x250), footer etc. And if anyone is interested he will directly contact you for buying Ad spots. Once your blog has a decent traffic then you can start selling ad spots to advertisers. This is one of the Best ways to earn money from a blog and also pays you high. To get started create an Advertise page with all Advertising details and Pricing and then if you anybody is interested in advertising on your blog he can checkout the Advertise Page for details. When a Company or an Individual Pays the Blog Author an amount just to write and Publish an Article or Review on his blog with Links back to the Company / Individuals site it is known as a Sponsored Post or Review. Many times some companies pays and asks Bloggers to Review their product and then recommend it to their audience. This is a great way to earn money and the amount given per sponsored post depends on the site's ranking. Unlike Advertising Networks, Sponsored Posts help you earn big amounts quickly. Recently I earned $150 from sponsored posts in a single day, Isn't it awesome?. The only con of this method is that It is not in your hands like Advertising Networks. With Advertising Networks you get paid every month but not with sponsored posts. Here Companies will directly contact you so it may take months for you getting another sponsored post offer. So this is a helps you earn big amount but is not recurring. So If you want to earn money by sponsored posts then first you'll need to work on your rankings, This Includes Alexa Rank and Google PR. Your Blog should also receive high traffic, Once you met the above points then Add an Advertise page to your blog with all advertising details. Nowadays many bloggers have started a new method of earning money and its is by providing services. Some examples of services is Migrating a Blog from Blogger to WordPress on behalf of the blog owner or Improving SEO for a website on behalf of the owner etc. This way you use your experience in helping out others and getting paid in return. This is also known as 'Hiring' where people hire 'Top Bloggers' to do risky jobs on behalf of them. This is a great way to earn money and here you have to use your skills. If you have blogging and SEO knowledge then you can also start using this method. Just create a Services page and list all the services which you can provide and then wait for the response. Affiliate Marketing is when you sign up as an Affiliate for a company Say Hostgator. You can use different promotional tools on your blog like Banners, Affiliate Links, Coupon codes etc and recommend it to your visitors. When a visitor buys a hosting package through your affiliate link, You get paid by the company. This is an awesome way to earn money and also attracts people because of discounts they get when they use your referral link. There are many websites who offer Affiliate marketing. You can use any Affiliate program related to your blog. For example if your blog is about blogging then you can use Web Hosting Affiliate programs to earn money. If you are good at something, Say writing then you can write an eBook and sell it off at your blog. You can also write a series of articles like 'How to grow your blog' etc. and then bundle them in an eBook and then sell it on your blog. You can also sell other things related to your site like products, merchandise etc. This can prove to be a great way to earn money through blogging. Lastly Here is a Way which I don't recommend but it can prove to be useful in some situations. If you want to stop blogging but instead of wasting your hard work getting high ranking and quality posts, You can sell your website and earn a big one time amount. The Amount depends on your website popularity and ranking, but you can earn thousands of dollars selling a well maintained and popular website. I won't include this method in my list as this is the last thing a blogger will do to earn from his / her blog But this is a great way to earn money after you quit blogging. There is a great article at ProBlogger.net which explains different ways of selling a website online. You can take a look at it here. 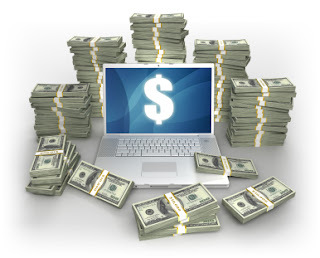 Some More ways to Earn Money Online. There are many other ways to earn money and I keep publishing articles on making money. In case you missed my previous articles, Here are some related articles. How to Place Adsense Ads for Optimum Earnings. Tips for Teens to Earn Money Online. Top Paying Advertising Networks to Earn Money. Tips to Increase Adsense Revenue.